American Cheese Society (ACS) - The Society's membership includes farmstead, artisanal and specialty cheesemakers, academicians and enthusiasts, marketing and distribution specialists, food writers and cookbook authors, and specialty foods retailers from the United States, Canada and Europe. Each year the Society hosts an annual conference and a world-renowned judging and competition, which culminates in the Festival of Cheese. Artisanal Cheese - With a mission to curate the world's finest cheeses, Artisanal selects from thousands worldwide to offer 200 remarkable, unique, and handcrafted cheeses. Artisanal specializes in the ancient craft of Affinage, a careful process that starts with farm-level selection, and follows with the nurturing and aging of each cheese. With a dedicated staff of affineurs, and state of the art aging caves, Artisanal alone offers the ability to provide you with the perfect cheeses for the perfect moment. Beehive Cheese Company - Specialty cheese - Utah. British Cheese Board - The British Cheese Board is the voice of British cheese and is dedicated to educating the public about the nutritional benefits of cheese as part of a balanced diet in the UK. California Artisan Cheese Guild - Dedicated to the bounty of artisanal, specialty and farmstead cheese made in the Golden State. Also see CACG Cheesemaker Map. Carr Valley Cheese - Wisconsin specialty cheese plant. Artisan cheeses include Black Sheep Truffle, Cave Aged Marisa, and Smoked Ba Ba Blue made from sheep's milk; Baraboo Blue, Chevre au Lait, Cocoa Cardona, and Goat Cheddar made from goat's milk; Bread Cheese, Jenny Eye Reserve, Sid's Bahl Baby Swiss made from cow's milk; and Canaria, Menage, Mobay, and Shepherd's Blend made from mixed milk. Cellars at Jasper Hill, Vermont - Twenty two thousand square feet, seven underground vaults and a dream as big as the American cheese movement, Cellars is cutting edge and visionary both in its conception and implementation. The purpose of creating this aging facility was to provide a place for cheesemakers to send their "green" cheeses to be ripened and marketed by staff who are specially trained to do just that. By reducing the initial investment and training needed by farms trying to diversify, Cellars will provide opportunity to a greater number of those farms. Cheese - Cheese - everything you want to know about it. Search cheese by name, by types of milk, by textures and by countries. Cheese (Wikipedia) - A generic term for a diverse group of milk-based food products. 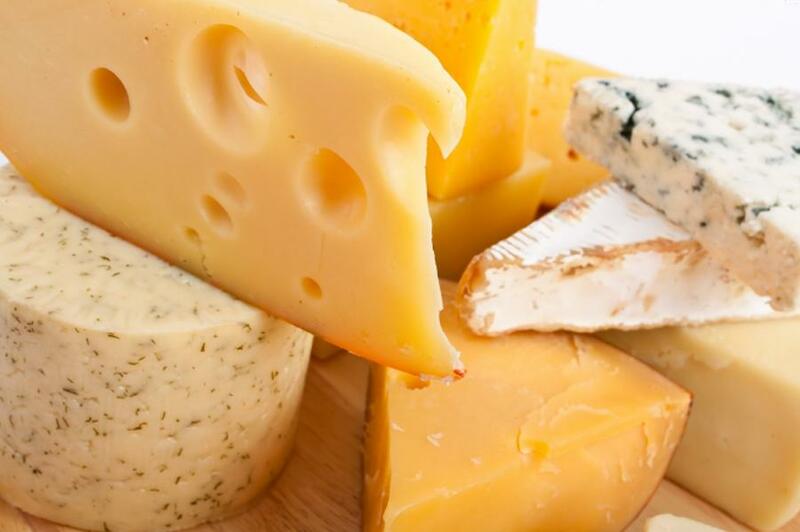 Cheese is produced throughout the world in wide-ranging flavors, textures, and forms. Cheese Plus - San Francisco's premier cheese and specialty food store. A cozy neighborhood shop located on the sunny corner of Polk and Pacific in Russian Hill, Cheese Plus features the finest cheese from the U.S. and around the globe as well as as an excellent selection of fine culinary products including Northern California artisan produced charcuterie, chocolate, specialty condiments, oils and vinegars, and our own house made sandwiches, salads, and spreads. Cheese Plus is owned by Ray Bair. Well regarded for his travels across the country and throughout Europe, Ray is constantly searching to find the source of authentic and traditional cheese and specialty foods. Also see Cheese Plus on Facebook. Cheese Reporter - A weekly dairy trade publication, covering legislative and regulatory issues, pricing and production trends, marketing and technology, as well as anything and everything a dairy manufacturer or dairy marketer needs each and every week to compete in this ever-changing dairy industry. Cheese School of San Francisco - The only independent institution of its kind in the nation dedicated entirely to helping people maximize their enjoyment and appreciation of cheese through education and tasting events, both structured and informal. Cheese Web, The - Created by one of the world's leading authorities on cheese, Juliet Harbutt, The Cheese Web has tons of information about cheese, cheesemakers, cheese sellers and cheese events around the world. Cheesemaking - Provides cheesemaking and dairy products around the world. Cowgirl Creamery - Since 1997, we have been producing organic cheese in Point Reyes Station, California, and promoting artisan cheesemakers throughout the U.S. and Europe. Cypress Grove Chevre - Arcata, California. Specialty: goat cheese. Dairy Management, Inc. ("I Love Cheese") - The nonprofit domestic and international planning and management organization responsible for increasing demand for U.S.-produced dairy products on behalf of America's dairy farmers. Gordon Edgar - Chief cheese buyer for Rainbow Grocery Cooperative in San Francisco and authour of Cheesemonger: A Life on the Wedge. Gourmet Cheese of the Month Club - Each month, members receive three, half-pound freshly cut blocks of extraordinary cheeses selected from boutique manufacturers around the world. You might receive a Gaperon, originating in France during the 14th Century, an authentic Lancashire by Ruth Kirkham, and an Italian Taleggio matured in the caves of Valsassina, all in one shipment. Each shipment is also accompanied by an informative and entertaining newsletter. Harley Farms - A restored 1910 dairy farm, with 200 alpine goats on nine acres of pasture in Pescadero, California. The farm grew from six pet goats to today's herd, with their delicious, critically-acclaimed cheese. Marin French Cheese - Located north of San Francisco, east of Napa County, west of Pt. Reyes and Olema and south of Sonoma County. The longest operating cheese company in America, with a commitment to cheesemaking practices using fresh milk from six neighboring family dairy farms. Acclaimed for its Triple Creme Brie. Max McCalman - A highly visible advocate for artisanal cheese production, and is renowned as one of the cheese world's living legends for his expertise, insight and passion. Max's work takes him across North America and Europe, speaking at conferences and festivals, and exploring the dairies and farms that contribute to artisanal cheese making. Max has been conferred the title of Garde et Jure as designated by France's Guilde des Fromagers. He is the Dean of Curriculum, Maître Fromager and Director of Affinage at the Artisanal Premium Cheese Center in New York City. Real California Cheese - The Real California Cheese seal was adopted in 1984 as part of a strategic promotion effort for the California cheese industry. The seal was created with heavy participation from the California Milk Advisory Board (CMAB), which was the first U.S. dairy advisory board to generate a set of industry standards for cheese production. Robiola (Wikipedia) - An Italian soft-ripened cheese of the Stracchino family, made with varying proportions of cow's, goat's milk and sheep milk. One theory is that the cheese gets its name from the town of Robbio in the province of Pavia; another that the name comes from the word rubeole (ruddy) because of the color of the seasoned rind. Wisconsin Cheese Makers Association (WCMA) - Gives voice to Wisconsin dairy processors on national and state issues. This webpage last updated on Saturday, October 29, 2016 6:49 AM.